Random House Trade Paperbacks, 9780812970401, 448pp. Vastly entertaining and outright hilarious, Paul Murray’s debut heralds the arrival of a major new Irish talent. His protagonist is endearing and wildly witty–part P. G. Wodehouse’s Bertie Wooster, with a cantankerous dash of A Confederacy of Dunces’ Ignatius J. Reilly thrown in. 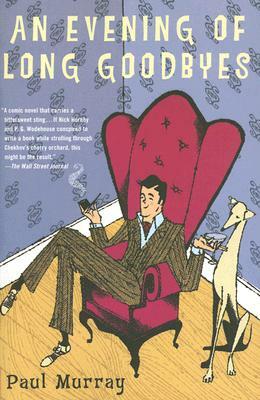 With its rollicking plot and colorful characters, An Evening of Long Goodbyes is a delightful and erudite comedy of epic proportions. Charles Hythloday observes the world from the comfortable confines of Amaurot, his family estate, and doesn’t much care for what he sees. He prefers the black-and-white sanctum of classic cinema–especially anything starring the beautiful Gene Tierney–to the roiling and rumbling of twenty-first-century Dublin. At twenty-four, Charles aims to resurrect the lost lifestyle of the aristocratic country gentleman–contemplative walks, an ever-replenished drink, and afternoons filled with canapés as prepared by the Bosnian housekeeper, Mrs. P.
But Charles’s cozy existence is about to face a serious shake-up. His sister, Bel, an aspiring actress and hopeless romantic, has brought to Amaurot her most recent–and to Charles’s mind, most ill-advised–boyfriend. Frank is hulking and round, and resembles nothing so much as a large dresser, probably a Swedish one. He bets on greyhounds and talks endlessly of brawls and pubs in an accent that brings tears to Charles’s eyes. And, most suspiciously, his entrance into the Hythlodays’ lives just happens to coincide with the disappearance of an ever-increasing number of household antiques and baubles. Soon, Charles and Bel discover that missing heirlooms are the least of their worries; they are simply not as rich as they have always believed. With the family fortune teetering in the balance, Charles must do something he swore he would never do: get a job. Booted into the mean streets of Dublin, he is as unprepared for real life as Frank would be for a cotillion. And it turns out that real life is a tad unprepared for Charles, as well. PAUL MURRAY was born in 1975. He studied English literature it Trinity College, Dublin, and took a master’s degree in creative writing at the University of East Anglia. A former bookseller, Murray lives in Dublin. An Evening of Long Goodbyes, his first novel, was shortlisted for the Whitbread Prize, and earned Murray a nomination for the Kerry Irish Fiction Award. "Paul Murray manages to fit a brilliant social novel in the small spaces of a farce, without ever losing his lightness of touch or his sense of humor. The result is something absolutely unique. Murray starts with Wodehouse (and does him proud), but ends somewhere entirely his own–somewhere very, very funny and surprisingly touching. I really love this book."